For years, Sergio Garcia carried the weight of being that guy—the game's greatest player never to have won a major. Now that the Spaniard is draped in Masters green, the monkey has jumped to another golfer's back, with only the PGA Championship remaining to shake it off this season. Golf's newest bum-luck poster boy? Analytics wiz Mark Broadie crunches numbers and names names. When golf history is written, it's the major winners who stand out. A player who has two major wins today will almost surely get into the World Golf Hall of Fame. No majors? Fat chance. (In 2014, the rules for induction were changed, mandating that players with fewer than two major wins now need 15 or more Tour wins to even be considered for the Hall.) That, in part, explains our fascination with the question: Who's the game's greatest player without a major to his credit? Until this year's Masters, Sergio Garcia was, almost certainly to his dismay, the consensus choice. With 30 international professional wins, including a Players Championship, and 22 top-10s in his 73 major appearances, Garcia was the epitome of "great yet majorless." At the 2016 Ryder Cup at Hazeltine, some of the hometown spectators mercilessly and repeatedly heckled him, chanting, "You have no majors!'' After the Cup concluded, Garcia spoke humorously of the ragging: "Well," he said, "I definitely know I haven't won a major, [because] I've been reminded probably 300 times this week." Because of Garcia's checkered history at the majors, and despite the Ryder Cup razzing, he was the clear fan favorite down the stretch this year at Augusta. His playoff victory over Justin Rose ended an 0-for-73 winless streak in majors and nearly 18 years of grand-stage frustration. Good for El Niño. Bad for someone else. The question begs, "Who's the greatest majorless player now?" "Majorless" is easy to measure; "greatness" not so much. One approach would be to measure a player's greatness by some combination of results in past majors (including his number of wins, top-fives, top-10s, etc. ), professional wins, top-10s in all events, money titles, career earnings, FedEx Cup points, scoring average and so on. The idea makes sense, yet how to combine them into a coherent and credible ranking isn't at all clear. Are three top-fives in majors worth more or less than, say, a win at the Players Championship? How many professional wins are comparable to one season-ending money title? These categories, of course, can overlap, so combining them in any fashion risks overweighting some factors and underweighting others. What we're left with is opinion, not dependable data. Using analytics, there's a more systematic, quantitative and (mostly) objective way to answer the big question. It starts with interpreting greatness in a way that's consistent with our basic intuition. First, great players have a track record of longevity and success, allowing us to assume that they have the potential to win a major. Second, we understand that circumstances beyond a player's control could have led to a different result in almost any major. For example, given the variables in weather, would the same player have won if the morning and afternoon waves had been reversed? If Dustin Johnson hadn't injured his back, would the 2017 Masters have unfolded differently? Small changes—a different bounce here or gust of wind there—can dramatically affect the leaderboard. In the 2016 Open Championship, would Henrik Stenson have won his epic battle with Phil Mickelson if his 3-wood on the final hole had rolled one more yard into the fairway bunker? Only one player can win each major, but it's easy to imagine multiple alternative outcomes. With all that in mind, my approach to measuring "major greatness" is to use an analytic I'll call expected major wins (EMW). It's the number of major wins that a player "should have" accumulated based on a calculation of expectations going into each major and the permutations of events that "could have" happened. Here's an example: In his prime, Tiger Woods had 1-in-3 odds of winning a major, meaning he was expected to win once and lose three times in four attempts. Based on these odds, Woods's EMW was one-quarter (0.25), or one major win per year. In the same major, an average Tour player might have had a 1-in-199 chance of winning, or 0.005 EMW. Tour Confidential: To concede or not to concede? Where do the odds come from? We could look at betting odds, but these have known biases, and it would be difficult to round up that information for all players in all past majors. Instead, I simulated 10,000 possible outcomes for each major played since 1990 and counted the fraction of times each player won (and, for good measure, finished in the top 10 and made the cut). The key is to create a model that accurately reflects reality, and to do that I, of course, use Strokes Gained. Unlike player scores, Strokes Gained takes into account the strength of the field and course difficulty. To make sure my model for calculating odds worked, I checked my results against real results. The players whom I determined would have a four percent major win rate had, in fact, won four percent of all majors since 1990. Here's an even simpler sanity check. When I excluded the 2017 Masters, my calculation of the majorless player with the highest EMW turned out to be—you guessed it—Sergio Garcia. So my model worked. All that was left to do was to run the numbers and draw up golf's most flattering dubious-achievement list. To be on it means you're one of the game's finest players—with one pesky asterisk next to your name. Hall of Famer Colin Montgomerie is a perennial presence on many "Greatest Player Who Never…" lists, but let's focus on active PGA Tour players, defined as golfers with a minimum of eight starts on Tour in each of the past two seasons and at least 15 major appearances under their belt. Of the pros currently bashing it out with the best in the world, my numbers say that golf's greatest player, post-Sergio, without a major win is…Steve Stricker. With his average odds of winning at 1-in-45, and having played in 68 majors since his U.S. Open debut in "93, Stricker was expected to win about 1.5 majors. That's the largest EMW number among majorless players from the "90 Masters through the "17 Masters. It's a sensible result. Stricker has recorded 13 top-10s in majors, has twelve PGA Tour wins (the most among active players without a major to their credit) and has finished in the top 10 in PGA Tour earnings six times. Could things have worked out differently for Stricker at the majors? Of course. In the final round of the 2013 U.S. Open, at Merion, he was a stroke off the lead until a shank led to a triple-bogey and a T32 finish. Stricker's best major finish was second at the 1998 PGA Championship. 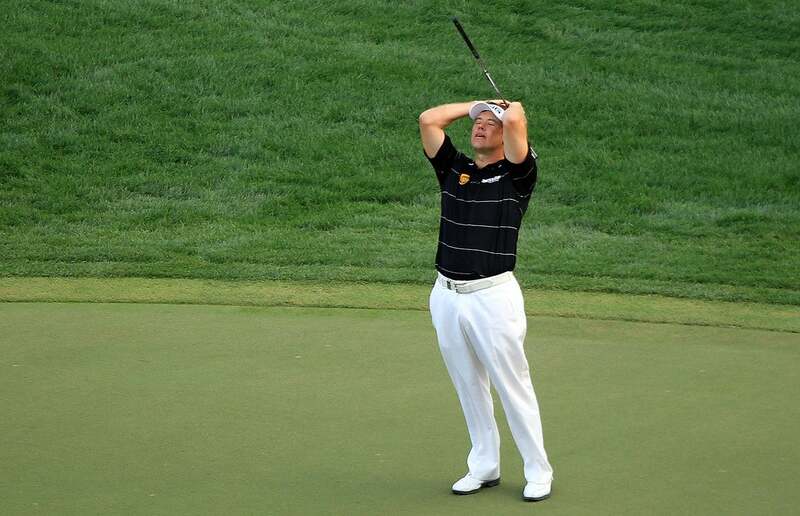 In the final pairing with Vijay Singh, Stricker was one shot back when they both found the bunker on 17. That season, Singh was ranked 94 in sand-save percentage, Stricker was ranked T7. But Singh got up and in, and Stricker didn't, losing to Vijay by two strokes. No doubt, similar heartache haunts the golfers who round out my top-five list of the greatest majorless players. The expected major wins method gives more than just a ranking—it provides a quantitative measure of frustration and disappointment. There are many great players who faded quickly in majors. Johnny Miller once said, "I knew how to win on Sunday, but in majors, I did choke with my putting." We can analyze "close calls" in majors by computing expected wins not at the beginning of the tournament but at the beginning of the fourth round. Here's a list of majorless players ranked by their EMW based on the leaderboard of each major (since 1990) after 54 holes. Lee Westwood, who tops the list, has experienced a brutal string of near-misses, including runner-up finishes at two Masters (2010, 2016), two third-place efforts at the U.S. Open (2008, 2011) and one at the PGA Championship (2009). None of them hurt quite as much as his flirtation with glory at the 2009 Open Championship at Turnberry. "I've gone from frustration to sickness," he told reporters after a three-putt from 45 feet on the 72nd hole left him one stroke out of a playoff with Tom Watson and eventual winner Stewart Cink. The sting, he said, was even sharper than the one he felt a year earlier at the U.S. Open, when only a 15-footer stood between him and a playoff spot with Tiger Woods and Rocco Mediate. He left the putt short. "Both [near-misses] are pretty sickening," he told the gaggle at Turnberry, "but, obviously, this is the Open Championship, and it's the one that means the most to me." Veterans like Stricker and Westwood are, in all likelihood, past their playing prime. But what of the current crop of studs in the hunt for their own major breakthrough? Below are active Tour players age 36 or younger ranked using my EMW method. When the PGA Championship is played next week at Quail Hollow, which sharpshooter—with one critical target missing in their career—would you put your money on? Bet on at least one thing: the winner will tip his cap to Sergio and be more than relieved to say, "Major win? Done that." Mark Broadie is a professor and vice dean at Columbia Business School. He is a member of the USGA's handicap research team, and developed the Strokes Gained approach to analyzing performance.